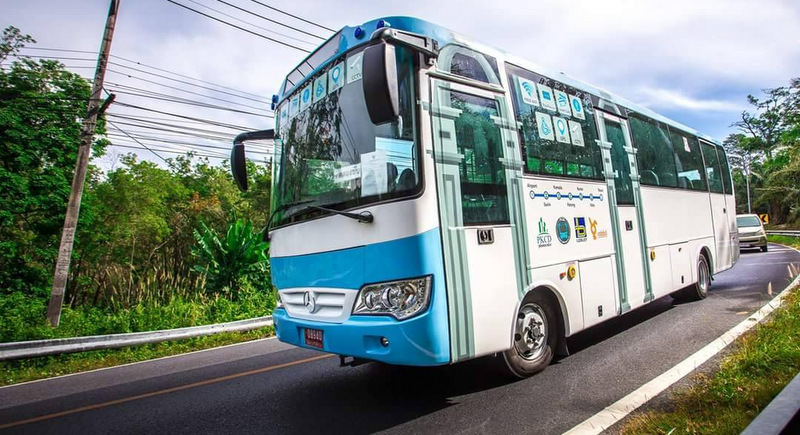 PHUKET: The Phuket Smart Bus started rolling from Phuket International Airport on Sunday (April 1), marking the end of the service’s extended trial period and becoming the first public bus service in action along the island’s west coast. 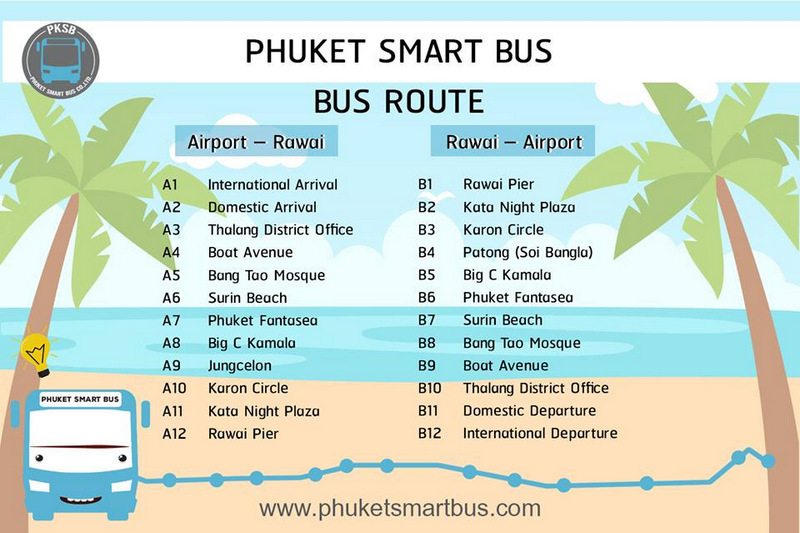 The Phuket Smart Bus is now in action along the island's west coast, from Phuket International Airport to Rawai Pier. 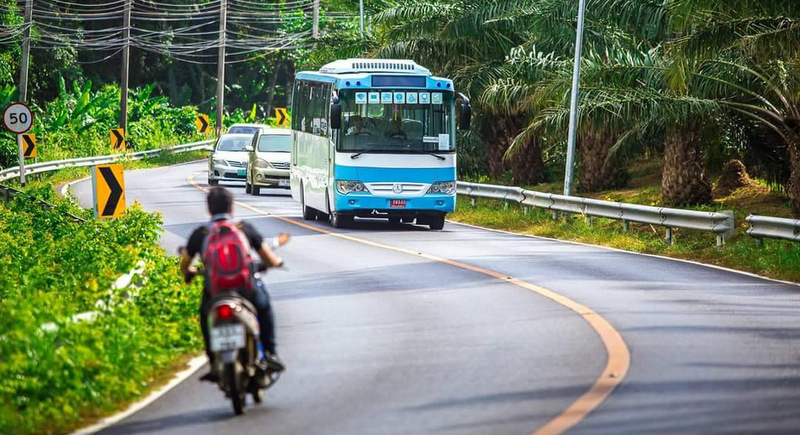 The service is operated by Phuket Smart Bus Co Ltd (PKSB), an affiliate of the Phuket City Development Group of companies (PKCD). 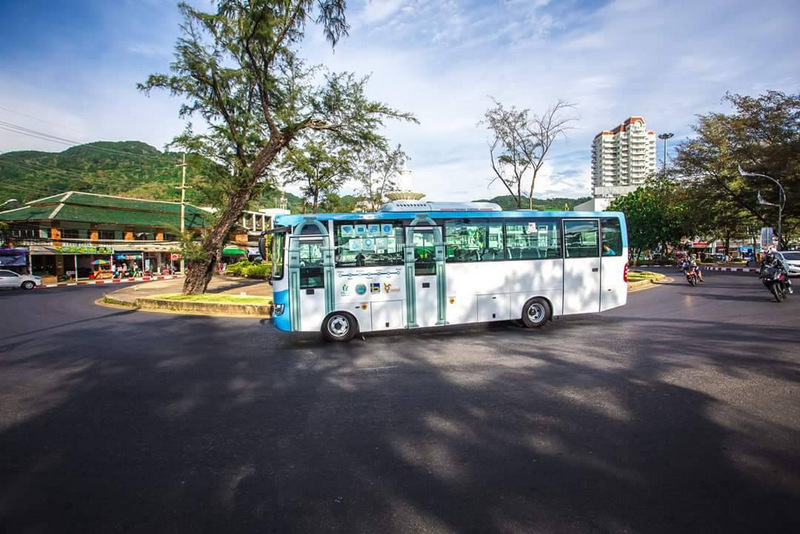 In turn, PKCD has launched the Phuket Smart Bus into public service in less than 18 months. 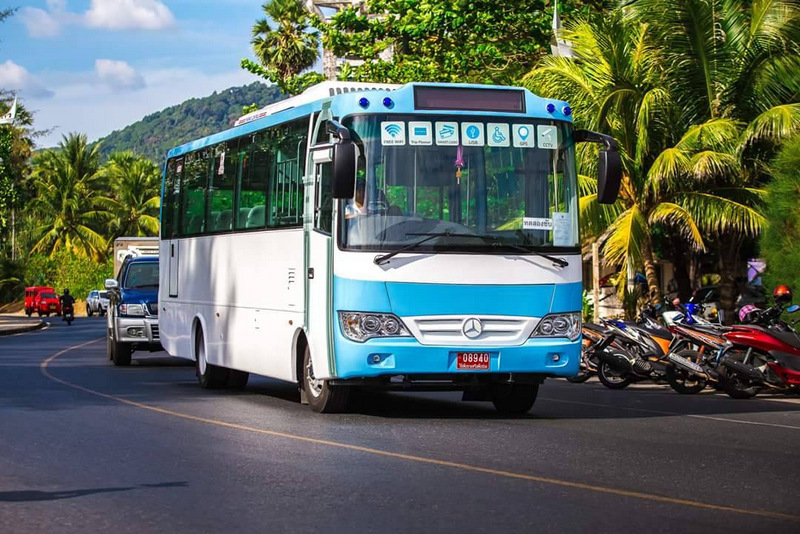 The buses now have 12 set stops (called “bus stations”) to pick up and drop off passengers, PKCD Executive Director Watchara Jaru-ariyanon confirmed to The Phuket News today (April 3). “There are 12 stops in each direction along the route, from Phuket International Airport to Rawai Pier and back again. Fares range from B50 to B170, depending on the distance travelled,” he explained. 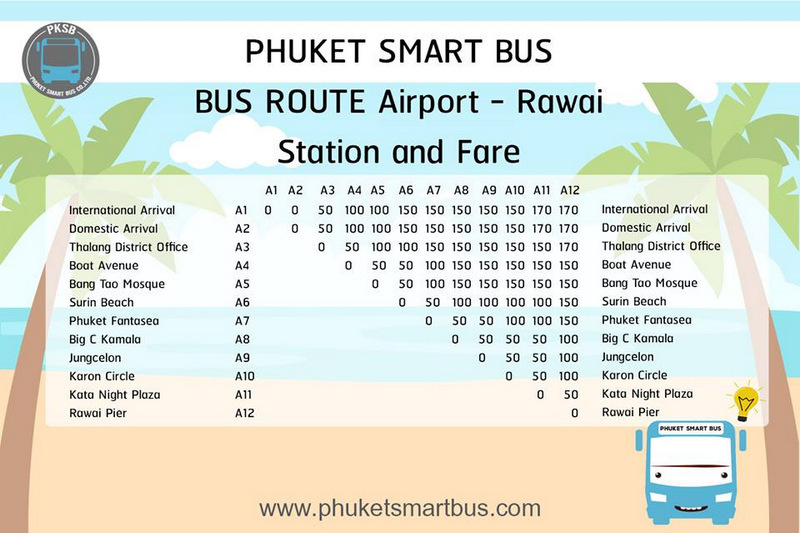 The first Smart Bus of the day departs Phuket airport at 6:45am and the last bus departs the airport at 7:15pm each night. Likewise, the first Smart Bus departs Rawai Pier at 6:45am each day with the last of the day departing Rawai Pier at 7:15pm each night. Details of where the buses stop – including Kata Night Plaza, Karon Circle, Jungceylon in Patong, Kamala and Surin Beach – and the fares are all posted on the website PhuketSmartBus.com (click here), Mr Watchara noted. Details of each bus’s current location and the exact location of each bus stop are all listed on an interactive map (click here), he added. However, Mr Watchara admitted, “The bus stops are not convenient yet because we can only pick up or drop off passengers, then the bus has to leave after a very short waiting time. This is not flexible enough for people who want to use the Smart Bus. 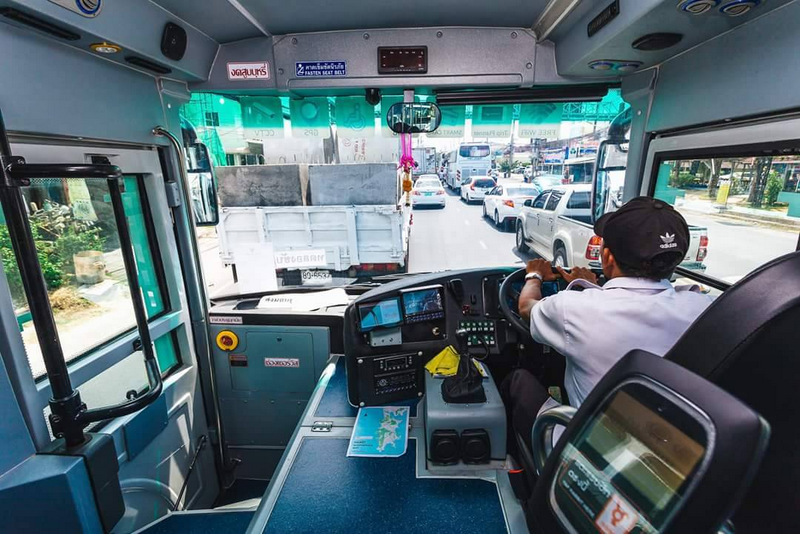 “We are asking through Phuket Governor Norraphat Plodthong for a bus stop at Phuket International Airport where the bus will be allowed to park. The Smart Bus needs time to wait for passengers. “I can’t confirm at this stage how long the bus will be allowed to park at the bus stop at the airport yet. We are still figuring that out,” he added. Mr Watchara reminded would-be passengers they need to purchase an e-money service “Rabbit” smartcard” in order to pay for their fares. “The card is sold on the bus by bus hostesses at B500 each, of which B100 is the card fee and B400 is the value left remaining on the card,” he said. The “Rabbit” smartcard needed to pay for the bus fare is an extension of the popular “Rabbit” smartcard service launched in Bangkok which also can be used as part of a nationwide program. The Rabbit card is available at more than 60 stores in Phuket and at thousands of locales around the country, and can be topped up and offers discounts at all participating outlets, which number more than 5,000. This is wonderful,but… How many buses are their? Also, there seems to be no activity on the interactive site. How about a smart phone app similar to that of Grab Taxi to track the movement of buses? That would solve the short standing time of the buses. Further expansion could include routs from 8 PM to 2 AM between Patong/Rawai and Patong/Surin to help keep drunken people off the roads. Finally a long awaited start is made and already the grumpy old men starts his drivel. Asking for a stop at Phuket Airport,even so it is clearly mentioned that they stop at domestic and international Airport!Asking why they mention Singapore? Isn't it him who always mention Singapore and tries to compare it with Phuket? Whatever they try to do here,never good enough for him.Should move away. Best of luck with this enterprise! I wish it great success, and hope to see it expand in the not too distant future. 1: Why bus service last call is at 07:15 PM in both directions? Why not till midnight? 2: Why not along the route bus stop poles, like in BKK and Singapore? But the way they start it now is not like in Singapore. Why they mentioned S'pore? And no Phuket airport bus stop yet? Pathetic scared for ..?